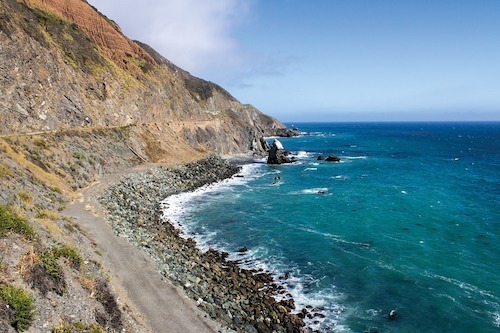 California earned its nickname “The Golden State” from the mid-19th century gold rush. Not only was gold found by placer miners in the streams and hard rock miners in the mountains, but beach placers at the ocean’s edge also produced a substantial amount. 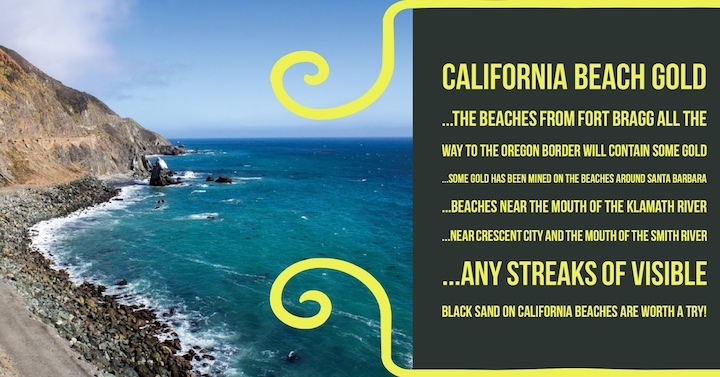 In April of 1851, the first famous California gold rush to the beach placers occurred. Just the idea of gold being found on the beach was incredibly exciting. This first find was located near the soon-to-be-accurately named Gold Bluff in northern California. However, considering the mining methods of the day, this turned out to be one of those “Anything that seems to good to be true, probably is” reports. Although some gold was recovered, most of it was missed back then. Over the next 30 years, many small rushes followed reports of rich gold-bearing beach deposits along the coast of California. There are many theories about where gold from the beach placers comes from, which may or not ever be proven. What we do know is that the gold is contained in silt which was transported by the waves. Beach sands rarely contain an appreciable amount of gold unless large storms occur at precisely the right time and place, when tides have transported gold nearby, for the heavy waves to bring gold to the beach. As the tide ebbs, you can thank Sir Isaac Newton for the gravity which causes the heavy gold to be left behind while much of the lighter material is washed back out to sea. You may have heard the old saying “Mother Nature is a cruel mistress.” There is no better example than when it came to searching beach placers. They can, often only briefly, be fairly rich in gold. However, by their very nature, beach placers are often only temporary. They can quite literally be here today and gone tomorrow, when the gold just washes away with the tide that brought it. Over the years, miners have used a wide variety of equipment to extract gold from the sand. Each method had both strengths and weaknesses. One plan for finding the gold was to go down on the beach and scrape up the iron-rich black sand, usually found in layers, which is most likely to contain gold. When the most promising spot was chosen, mules laden with empty containers were led down to the location at low water. The containers would then be filled with black sand and brought away from the surf where it could be piled up and then separated. Since wave action literally changes the gold’s location overnight, each day a new search must be made for the iron sand. Once the sand which most likely to contain gold was removed, the tricky part still remained. Beach gold is normally extremely fine, often not much more than powder, and surrounded by a lot of useless materials, so recovering it from sand can be very difficult. The old timers used a number of different types of sluices, and certain other equipment for many years, in their attempt to separate the fine gold. To say this was inefficient does not do justice to the term. It was later determined that miners in many cases lost 80% of gold they found during these separation treatments. The old-time miners sometimes used mercury to recover this fine gold, but without being able to accumulate the fine gold into a rich concentrate, this still didn’t allow for optimal recoveries. Now that you have had your little history lesson and have an idea of where to go, be sure to take advantage of generations of accumulated knowledge. The original prospecting method wouldn’t really be any different from how the old-timers did it. Look for pay streaks of black sand. This is where the gold is likeliest to be found in good concentrations. Some people use a metal detector to locate these paystreaks, but your eyes will work just fine too. Next, you need to take advantage of our modern technology to catch that fine gold. The old wooden sluices had a hard time catching the fine gold dust, but a modern sluice with quality matting will do considerably better. The Blue Bowl Concentrator is another neat piece of equipment that will also do the job much more efficiently. The Blue Bowl combines a modern sluice a pump for water, and an entire self-contained system that will separate the gold at a previously unattainable rate. You can bring your Blue Bowl with you to the beach or use it at home. For the most optimal capture rates, the Gold Cube is probably the best out there. It is probably the best device invented to date for mining fine beach sands. It can find specks of gold so tiny that you can hardly even see them.